Charles Le Coeur [1830-1906]; sold 14 May 1924 by the Le Coeur family to (Hector Brame, Paris); sold 2 December 1924 to Comte de Rivaud; his heir, Mrs. Gambert de Loche; sold 10 April 1958 to (Hector Brame, Paris); sold July 1958 to Mr. Paul Mellon, Upperville, Virginia; gift 1983 to NGA. See invoice dated 30 July 1958 from Hector Brame and letter from Philippe Brame dated 8 June 1999, both in NGA curatorial files. Gifts to the Nation: Selected Acquisitions from the Collections of Mr. and Mrs. Paul Mellon, National Gallery of Art, Washington, 1986, unnumbered checklist, repro. Masterpieces from the National Gallery of Art, Washington, Kyoto Municipal Museum of Art; Tokyo Metropolitan Art Museum, 1999, no. 31, repro. Impressionist Gardens, National Gallery of Scotland, Edinburgh; Museo Thyssen-Bornemisza, Madrid, 2010-2011, no. 15, repro. Renoir: Tradition and Innovation, The National Art Center, Tokyo; The National Museum of Art, Osaka, 2010, no. 50, repro. In the Presence of Things: Four Centuries of European Still Life Painting, Part Two: 19th-20th Centuries (1840-1955), Fundaçäo Calouste Gulbenkian, Temporary Exhibitions Gallery, Lisbon, 2011-2012, no. 11, repro. Dumas, Paul. "Quinz Tableaux inédits de Renoir." La Renaissance de l'art français et des industries de Luxe 7, no. 7 (July 1924): 365, repro. European Paintings: An Illustrated Catalogue. National Gallery of Art, Washington, 1985: 348, repro. Kopper, Philip. America's National Gallery of Art: A Gift to the Nation. New York, 1991: 277, 280, color repro. Whelan, Richard. 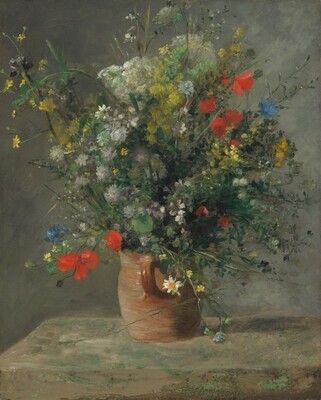 Impressionist Flowers: Art of the Bouquet. Cobb, California, 1998. Dauberville, Guy-Patrice, and Michel Dauberville. Renoir: Catalogue raisonné des tableaux, pastels, dessins et aquarelles. 5 vols. Paris, 2007: 1:no. 22.